Now it’s Tabatha’s turn to decide where our poem will go. Look on the sidebar to see links for where the poem will travel next. This entry was posted in Uncategorized on April 20, 2013 by Buffy Silverman. and even up the score. And write our story on their pages. Three weeks to buzzz and mate. while poison seeps from beetles’ knees. And that’s probably more time than I should have spent playing with these! Check out what’s going on for Poetry Friday at Irene Latham’s Live Your Poem… And while your there, read the Progressive Poem’s progress. I’m up next! This entry was posted in Uncategorized on April 19, 2013 by Buffy Silverman. Did you know that today was Haiku Day? I did not, until I read a facebook post with a link to Robyn Hood Black’s bog, about 5 minutes ago. I have not written much haiku–I think most of my poetry ideas are too long and convoluted for that form–but I always admire these succinct moments. Last week I was inspired to write a haiku after watching Laura Purdie Salas’ poem starter video with a poem from GUYKU: A Year of Haiku for Boys. I’m guessing the second choice is most haiku-ish. But it somehow feels incomplete. So for now, I’ll leave you with the whispering wind. This entry was posted in Uncategorized on April 17, 2013 by Buffy Silverman. Happy Poetry Month, with a side of diamantes? I’m amazed by the creativity coursing over the blogosphere. It makes me feel a bit of a slacker, as I’m not adding much to the April poetry celebration. I suppose my novice blogger status justifies my lack of original contributions…maybe next year I’ll commit to something creative for the month. I think this visit will be a treat. Instead of speaking to hundreds of kids at an assembly, I’ve got three small sessions (about 50 kids each) for the young author’s day at the Intermediate School District. Each teacher from all the elementary schools in the county selected two students to represent their class. Typically my school visits focus on my nonfiction writing. I like to present a few approaches to the same topic–usually an informational text, a creative nonfiction story, and a poem. I try to make my presentations as interactive as I can with a large group, having younger kids act out parts of a story and older kids participate by reciting poems for two voices. I ask the kids lots of questions– and I wear funny hats! Because I’m working with small groups in Manistee I’m planning to take the participation one step further–we’re going to write a group poem at the end of the 2-3 (FROGGIES!) and 4-6 (BATS) sessions. I’ve led poetry and nonfiction writing workshops, but this will be different–it will be a short (5-10 minute?) activity, and the entire group will write one poem. I’ll start by having kids “collect” their favorite words from a few poems. 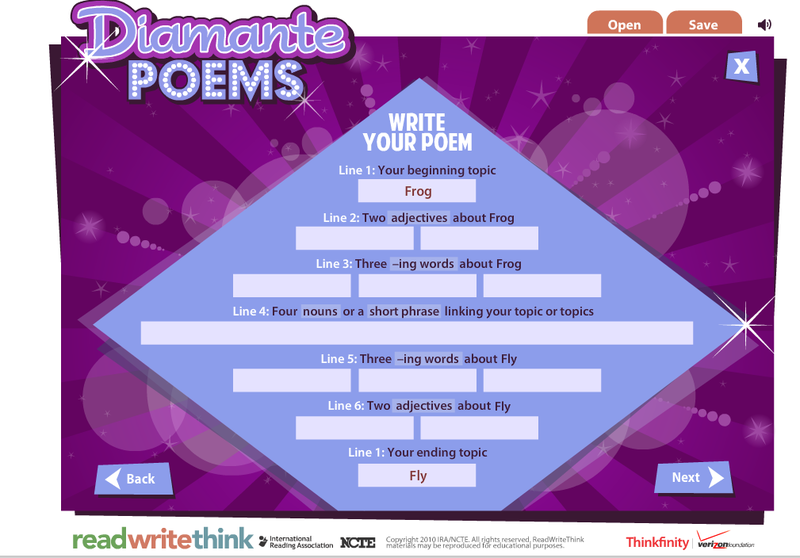 Then we’ll brainstorm words for a diamante (frog to fly; bat to moth.) I’ll plug in some of the words we brainstorm to write a draft. Not sure how well this will work, but I’ll give it the old AprilPoetryMonth try. Do you have any quick poetry activities that have worked well with large groups? If you’d like, share them in the comments! I love that the older kids suggested quiet as an adjective for both the bat and moth–and how well that bridges the beginning and the end. This entry was posted in Uncategorized on April 4, 2013 by Buffy Silverman.